Following on from last week’s Hubba NX review, here’s the variant that is designed for tougher conditions. This is the MSR Hubba HP. 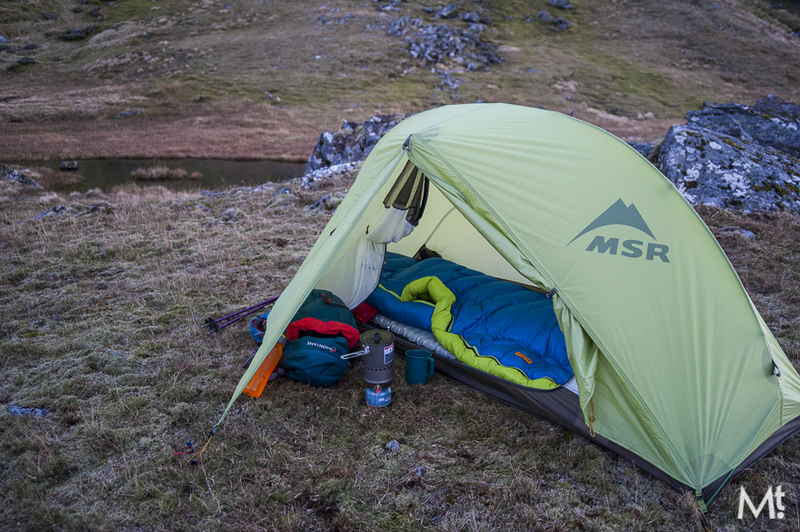 This tent has been around for ages, in fact it’s disappearing from the MSR books but you can still buy it from a number of retailers. That’s not to mention that the second hand tent market is booming, so I’m still gonna talk about it, because I have good reason to. Spec wise, it’s a beefed up version of the Hubba, made to better handle traditional European conditions, that’s to say wetter and windier than the Americas. A tent designed for wet and windy has to be a candidate for the Highlands. The inner has more solid material and less mesh that the standard model and the groundsheet is beefy with a hydrostatic head of 10000mm. The 20D PU coated nylon canopy has a little more coverage and the pole attachments and guy points are reinforced. The pitching arrangement is the same as the Hubba, it goes up inner first with a central pole with hubs and Y-splits at either end and a short crosspole in the centre. So, do the changes that make it more Europe friendly actually work? Short answer, yes. I’ve been using this tent for well over a year in all sorts of conditions and it’s stable, even in gale force winds. The mainly solid walls on the inner help with minimising wind ingress and reducing heat loss, although it’s still vented so condensation is minimised. On paper, it shouldn’t be this good; the fly is only rated to 1000mm HH, but so far it’s done a fine job of repelling wind-driven rain and snow and I’ve stayed dry and comfy. There are no snow valances, but build a wee wall with the shed snow and it’s fairly snug. There’s no rain gutter on the main zip, unlike the NX, but so far the water resistant zip hasn’t let in. The porch itself is spacious, with room to store gear and cook in. Internal space isn’t palatial, but adequate for long winter nights and wee gear loft is handy for storing your torch in, but nothing too hefty. The supplied MSR mini groundhog stakes are decent enough, although I binned the stuff sacks for them and the poles. I don’t need every component in a pretty little bag. The guys are fine, but I’ve replaced with my usual dyneema and linelok combo, mainly just because I can trust them. Fire-and-forget should always be the goal with shelters. If you have to spend the night fiddling with it, something’s gone wrong somewhere. The packed weight for my working model is 1390g, which isn’t particularly light, but it’s decent for a tent you can take out to play with in the winter. Pitching inner first is still a minor bugbear for me, but it’s not a big deal. The freestanding nature of the tent means you can slam it up, move it about then sling the fly over it pretty quickly. It’s still mildly annoying having to rush pitching when it’s hosing rain, but it’s nothing a packtowl and some efficiency can’t sort. Overall it’s a bomber tent which will protect you in some nasty conditions. If you’re looking for a solid 3 season tent that’s also 4 season capable at a reasonable weight you’re onto a winner with the Hubba HP. It’s a good time to go and buy one too. Recommended. Jen you are both wise and kind! When it comes to the Akto, in comparison to the Hubba HP, there's not a massive difference in space. The Akto has a little more internal space but a smaller porch. The Hubba is slightly taller for sitting up in. The Akto is arguably a bit sturdier, given the materials used however it does come with a weight penalty and an increased pack size. You might find some reports that the Akto is more prone to condensation, but in my experience the venting is ok. It all comes down to the usual triangle of decision: weight/cost/durability, it all depends on personal preference. Me, I'd always rather carry a pack with a Hubba in it than an Akto, although that might just be my knees talking. Hi Michael, thanks for such a great review. I wish there were more detailed and inciteful kit reviews available. I just wanted to add that i have used Hilleberg's Akto for 10 years and it has seen me through many incidences of wild weather (although, from the inside, it does feel like you might not live to see the dawn). I think the key difference for me (between the two) is that the Hubba is free-standing, where as the Akto needs to be pegged out. This means it cannot so easily be moved once it is put up and you are also relient on the ground being soft enough to take pegs (or finding large stones to tie the guys to). On the other hand, the Akto is put up inner and outer together (or outer first) where as, the Hubba is inner first (and so is more likely to get wet inside)... pros and cons!! Thanks Emily. You're quite correct, it's all about the pros and cons, none of these things are perfect. That's what makes it fun, trying to find the best combination for your needs. That's an odd one Baz, I've never had that problem, and I've used it in a force 9. I do always pitch it arse-into-the-wind though. I know MSR refunded me but just lost confidence in it. It was pitched arse into the wind but the wind changed during the night. Ended up with a Ultra Quasar the weight penalty compared to the Hubba is massive ! 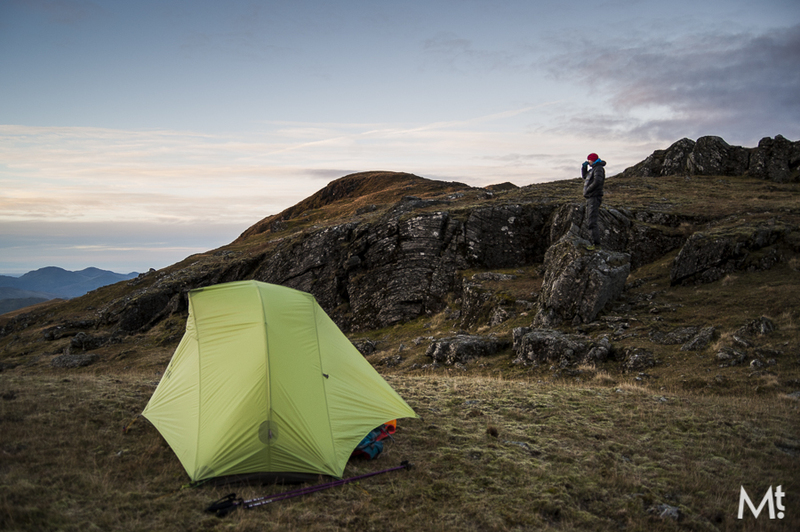 The ultra quasar was my first proper mountain tent. Loved that tent. I still have it, but at north of 3 kilos, it doesn't get out much! It's the holy grail really isn't it? A lightweight 4 season tent. The Nallo is a fine choice. It's plenty roomy for two plus kit and it'll see out the winter no problem. The downside is the weight, but it's fine if you split it between two of you. If on the other hand you're looking to carry it yourself, that's a whole different story. It all depends on how 4-season you really mean. Do you want to camp in the glens in the snow, or do you want to summit camp in a force 9? I find most tents rated 3 season can be tweaked to be more winter friendly, and a lot of tents that are listed as 4 season are just 3 season tents in reality. I'd suggest you look at the Scarp 1 and probably the Soulo if the weight is acceptable. For my money, the Vaude Power Lizard 1p-2p with some guy tweaks is still the sweet spot for weight/space and weather resistance, I can live with that. I've had condensation but not to the point where it caused a problem, but I tend to camp high up in windy locations. No leaking zips yet, but I had the same thought about the lack of guttering. Hi Michael, I really liked your reviews, thanks for writing them! For a week on the West Highland Way, would you recommend the NX or HP? 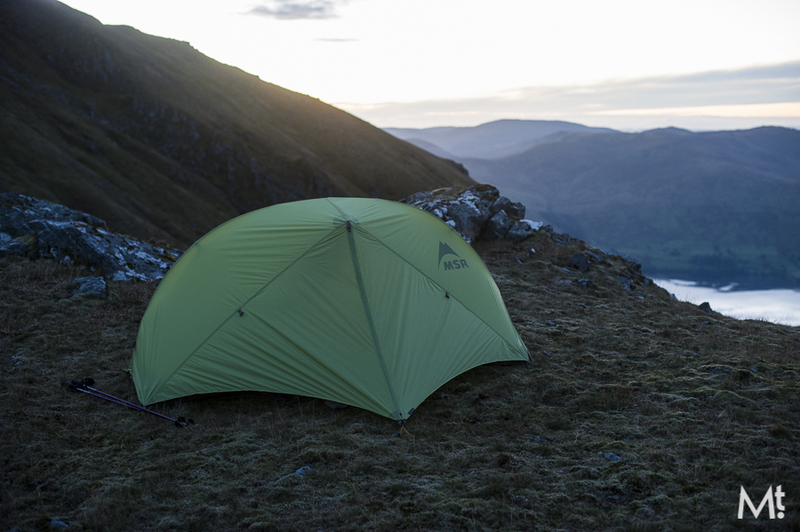 Or rather something tougher like the Hilleberg Akto? I want to use a down sleeping bag, so I'm especially concerned about condensation in there. Thanks if you have an answer, or a recommendation. I note that in the pictures you do not seem to use the guyline points... Was this the case? Would the tent be stable in high winds without using guys? Hi Joerg, it depends when you plan to be going, but the NX will do fine if you're camping that low. If it was late Jan/early Feb, I'd suggest the HP for wind insulation, but if it's a summer/autumn trip, you'll be more comfortable in the NX. I've used it in both circumstances. In the photos in the review there's just a single rear guy and the wind was 30mph+ that night and it was fine. I only tie on the guys if I expect it to get really breezy. Hi! My boyfriend and I will be cycling across Europe, Asia and Australia in April. We will spend winter in the mountaneous - and very cold - Kyrgyzstan. We were thinking of buying the Hubba Hubba HP and that is how I came across your great review. Do you think this is a good choice for this sort of trip? We do not have any wild camping experience whatsoever and looking for the right tent is getting ridiculously overwhelming. It's a very decent tent and handles cold conditions well considering the weight. Enjoy the trip! Hi Michael, great review as always! It looks like a great three season tent. Te only thing that lets it down in my book is only being able to pitch the inner first. I currently have a Zephyros 1 which I used at the start of the year during a winter walk of the WHW. I used to like to tent, but almost every night during that trip the inner was dripping with condensation and the lack of head room almost drove me insane! 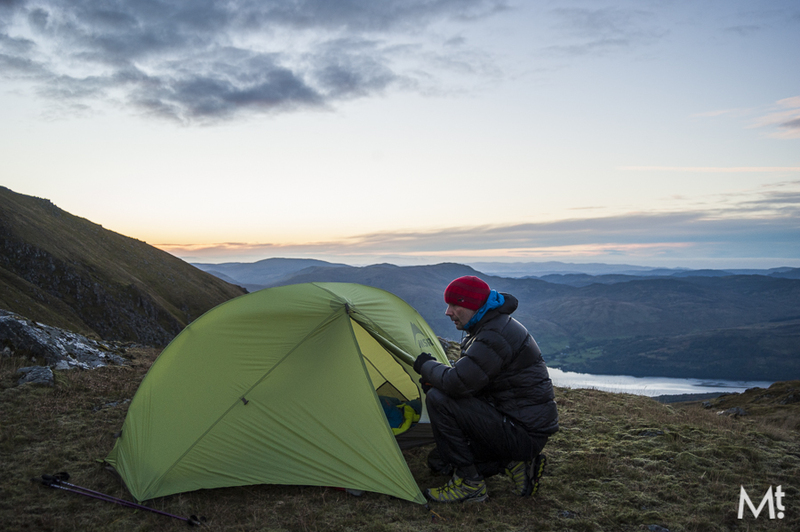 Could you recommend a three season tent which would be used for the occasional winter summit camp? I've looked at dozens but can't seem to make a decision. I see from previous reviews you seem to like the Power Lizard tent, but I know there are other options. Cheers! I use the MSR Hubba HP in winter if I know it's going to be nasty weather, it seems to work for me. If the forecast is cold but not too windy, then I'll take just about anything, I'm summit camped in winter in almost all the tents you'll see on here. Great stuff, it's a good tent and even better if it's a bargain :) Let me know how your trip goes and if you need any local info just give me a shout. Hi from Alaska. I have pitched my Hubba hp and other similar tents fly first many times. I pitch the fly with a ground cloth then get inside and put up the tent body. It is a bit more trouble and you have to open the door and sit inside the tent to finish the job. I carry the tent body in a separate waterproof stuff sack and if it is raining in the morning I take it down tent body first. Hi, I've got the Hubba (solo) for almost 5 years. Good tent, tough discovered the first crack on the edge of a pole stick last week. I duct-taped it, and we shall see how it will last. The main problem is the length of the poles; quite long for bike panniers, otherwise no issues.